GoAir Intentional operations: The flight from Phuket to Mumbai will start from October 12 at an introductory fare of Rs. 18,999. 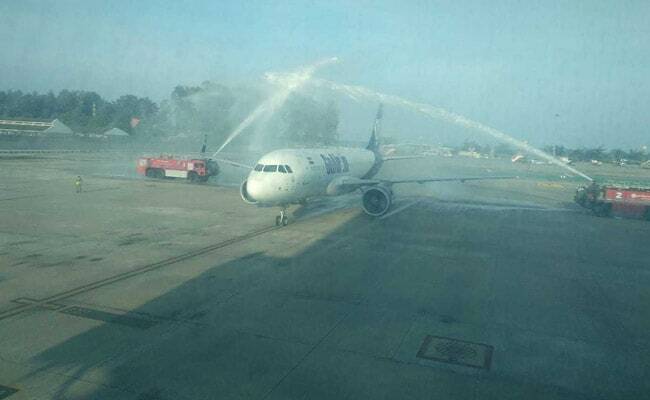 GoAir's flight was welcomed with a grand water cannon salute upon its arrival at the Phuket Airport. GoAir, which recently announced commencement of its international operations, today launched its first ever direct international flight to Phuket from Delhi. The new international schedule introduces direct flights connecting Phuket to Mumbai and Delhi, the airline said in a press release. GoAir will operate its first international service with an Airbus A320 Neo aircraft. This marks the commencement of a direct two-times-a-week service on the Delhi-Phuket-Delhi sector and a direct three-times-a-week service on Mumbai-Phuket-Mumbai, according to the airline's statement. "The launch of our first service to Phuket represents another step of transition from a domestic carrier to a global airline. Phuket is a key market in India and holds a significant base for business and tourism," said Cornelis Vrieswijk, chief executive officer, GoAir. The flight from Phuket to Mumbai will start from October 12 at an introductory fare of Rs 18,999, the carrier noted. Tickets for the new flights can be booked through the airline's website, goair.in, or mobile app. With the launch of international flights, GoAir becomes the sixth domestic airline to start international operations. The carrier will be flying overseas nearly 13 years after it started domestic operations in November 2005. Two years ago, GoAir became eligible to fly overseas when it took delivery of its 20th aircraft, according to news agency Press Trust of India. GoAir currently operates 230 daily flights to 23 domestic destinations, with a fleet of over 35 aircraft.